Alison read 73 books of her goal of 52! Alison read 54 books of her goal of 50! Alison M. Thompson is the founder of ADHD Kids and a trained NLP Practitioner and Life Coach, a route she was propelled down due to the ongoing experience of raising a son with ADHD. She works to educate parents and teachers on understanding and dealing with ADHD in children. In 2008, Alison was nominated and shortlisted for the mother@work Most Exceptional Working Mother Award. She was also a semi-finalist in two categories of the Venus Awards Oxfordshire in 2014. 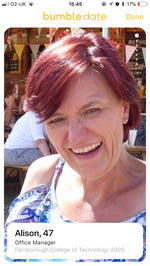 Alison lives on the Oxfordshire/Wiltshire borders with her partner, son and three mad cats. In her spare time she enjoys reading, swimming and going to auctions. We’d love your help. Let us know what’s wrong with this preview of How To Be Right by James O'Brien. We’d love your help. Let us know what’s wrong with this preview of Recipe for Love by Ruth Saberton. We’d love your help. Let us know what’s wrong with this preview of A Wedding at the Comfort Food Cafe by Debbie Johnson. We’d love your help. Let us know what’s wrong with this preview of The Piano Man Project by Kat French. We’d love your help. Let us know what’s wrong with this preview of Death Of a Temptress by P.F. Ford.